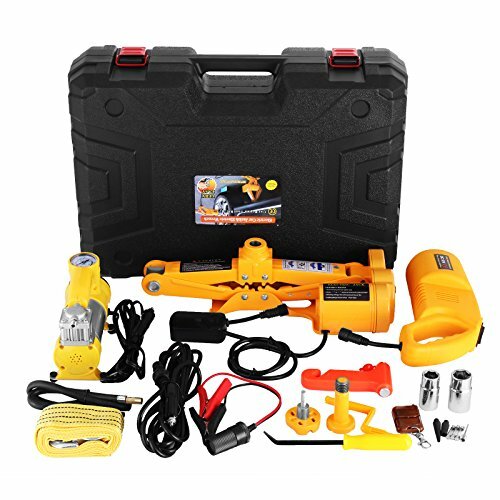 Electric scissor jack plus impact wrench set is another technology innovation in tire replacing. This product set is able to work with car cigarette lighter power or car battery. By controlling lift switch, the mechanical part of the jack can be adjusted freely and smoothly, thus lifting car tires fast. Meanwhile, electric wrench can conveniently disassemble or fasten the fixing nut of different wheels and vehicles, only by a simple press of its start switch. High Stability and Safety: Heavy-duty steel construction, large base, and saddle make this car jack strong and stable. 2.Electric Impact Wrench:Rated Power:80W;Max Torque:480N.M;Cable Lengh:11.5 ft. If you have any questions about this product by Bestauto, contact us by completing and submitting the form below. If you are looking for a specif part number, please include it with your message.